This follow-up brief recapitulates the foresight exercise of the “Manufacturing Visions – Integrating Diverse Perspectives into Pan-European Foresight (ManVis)” project. Six years after the project was concluded, we look back with the purpose of extracting key lessons learned. We ask what the mid-term and long-term implications of this foresight exercise are, specifically how effectively the Delphi method was deployed to examine a wide spectrum of aspects underpinning the future trajectory of European manufacturing with a particular emphasis on the elaboration of scenarios that provide a broad basis for public discussion on the future of European manufacturing. This follow-up brief draws particularly on the lessons learnt from the organisers’ perspective. The central purpose of the ManVis project was to inform a continuous process of policy development to enhance the competitiveness of the European manufacturing industries through a structured foresight exercise. In particular, the ManVis project was expected to contribute to completing the picture of the socio-economic dimensions that shape the technology dynamics in European manufacturing industries. The policy relevance of the ManVis project was essentially linked to its role as one of the central strategic foresight studies in which the preparation of a more detailed Strategic Research Agenda (SRA), aimed at paving the way for the definition of research priorities to be implemented via the EU’s future RTD Framework Programmes, was anchored. The ManVis foresight was launched in response and complementary to the results obtained from previous foresight exercises and empirical surveys indicating that manufacturing in Europe needed to strengthen its innovation capacity in an environment where manufacturing is increasingly being relocated to locations outside Europe. Together with the FuTMaN (“Future of Manufacturing in Europe 2015-2020 – The Challenge for Sustainable Development”) project, the ManVis project was a central pillar of the Manufuture European Technology Platform, composed of high-ranking representatives of European industry and the scientific community, that was initiated in December 2004 with the explicit purpose of elaborating specific technology roadmaps, both horizontal and sectoral, to define the priorities for the first calls for proposals of EU’s Sixth Framework Programme (FP6). (a) Which technologies will be relevant to European manufacturing? (b) What role will European manufacturing play in a more competitive world? (c) Is European manufacturing prepared to meet the challenges of knowledge-based manufacturing? (d) Which visions and challenges emerge for European manufacturing? Delphi is a long-established methodology to create consensus among a wide range of opinions as a basis for developing an informed view on visions and alternatives in the setting of priorities in controversial or complex fields of science and technology policy. The ManVis Delphi survey collected the views of more than 3,000 manufacturing experts in 22 European countries as well as those of stakeholders and overseas experts that were collected during workshops and through interviews. The Delphi survey covered developments of all relevant aspects of manufacturing from technological dynamics to organisational concerns and issues related to sector-specific developments. In parallel to the survey, scenarios on the future development of the demand side of manufacturing were elaborated. (a) Micro-electromechanical devices, smart materials and products using nano-coatings represent long-term developments of new types of products with the potential to disrupt markets. (b) New manufacturing technology principles, such as bottom-up manufacturing technologies are only expected in the long run. Manufacturing technologies using biotechnologies to create and manipulate inorganic material and products, such as nano-manufacturing, should be on the long-term “radar” of RTD policy. (c) Micro-electromechanical systems (MEMS) as well as flexible organisation and automation strategies combined in reconfigurable manufacturing systems supporting flexible business strategies are important topics on the short-term research agenda. However, as a particular aspect, the experts surveyed viewed the unmanned factory with skepticism. Instead, they forecast that humans working with flexible automation solutions will play an important role in creating flexibility. (d) Only long-term automation visions comprise human-machine interfaces such as man-machine speech recognition, self-learning systems and co-bots. From these key messages the following implications were derived for the role of manufacturing research in combining the long-term horizon in technology trajectories with the short-term needs of firms to innovate successfully: Basic manufacturing research needs to prepare for new challenges, whereas applied manufacturing research should focus on the adaptation and transformation of existing technologies and organisational processes. 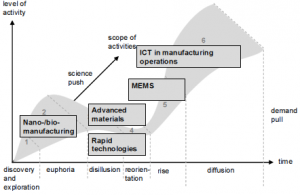 Considering the functions of manufacturing research, it has been suggested that these key messages on future technology dynamics be discussed using the concept of the combined science-technology cycle of innovation (see Figure 1). The ManVis Delphi survey covered many aspects of knowledge-based manufacturing related to the working environment. In particular, organisational concerns as they are linked to new challenges of product development were examined. In one of the interviews conducted for this follow-up, however, one of the organisers of the foresight process highlighted that – although the ManVis project was considered a “creative pool” for the construction of the Manufuture platform – contributors to the platform were skeptical concerning several of the organisational challenges. This was explained by a lack of interest in issues of work organisation at the company level, in particular on part of the predominantly larger industrial firms represented on the platform (SMEs were not represented). In addition, the organisers stated that the ManVis foresight contributed greatly to the integration of non-technological aspects in the debate on the future drivers shaping technological dynamics and on the demand for skills and competencies. Furthermore, the interviewee argued that the Delphi results had the intended wide-ranging impact because the survey did not focus on sector issues alone. Although this impact was important in consolidating the field of manufacturing research, the foresight results were not followed up by more in-depth indicator-based (e.g. patents) research with a greater focus on sectoral issues. This was, however, not considered a methodological constraint but rather a weakness in following up on the Delphi results. (a) The organisers’ interventions during several workshops at the national level, held to prepare the Delphi survey, played a central role in condensing the themes and elaborating the Delphi statements. As in any Delphi survey, the heterogeneity of the participants assured the validity of the results. In particular, the responses to the survey highlighted the facilitator’s role in coordinating the pool of heterogeneous expertise coming from a great diversity of technological and non-technological fields during the initial workshop, at which a list of 100 statements on a wide range of manufacturing topics was generated, as very important for the final outcome of the Delphi process. (b) With regard to the stability of the responses to obtain a consensus among the participating experts, the summary feedback of aggregated responses of the second round did not generate any significant new changes. Under efficiency considerations, it could therefore be argued that the survey administration could have used statistical methods to analyse the data from the first round to assess whether any subsequent rounds were needed and, if not, terminate data collection after the first round. The ManVis Delphi survey results provided a broad basis for public discussion on the future of manufacturing in Europe. In particular, by complementing previous foresight studies intended to improve the self-understanding of the European manufacturing industry, it constituted an important pillar in the development of a strategic manufacturing research agenda at the European level. Several of the issues that were highlighted by ManVis, such as the need to explore the implications of user-driven innovation for manufacturing systems, were taken up in FP6. Beyond its intended effects, the ManVis foresight also had some important unintended effects such as making a central contribution to the definition of research needs of the new member states that joined the European Union during the 2004 enlargement. Another central achievement of the ManVis foresight process was also an unintended side effect, namely to involve these new member states in the development of a Strategic Research Agenda on manufacturing in Europe. Since the financial budget for dissemination activities was cut significantly during the negotiation phase with the European Commission, the ManVis dissemination approach was under strain from the beginning of the project. Nevertheless, the project reported the results of the foresight to a wide audience of industry and governmental stakeholders at the Bled Conference in October 2005. This conference, which would not have been realised without the national resources of the Slovenian ManVis partner, provided a strong signal of interest in and relevance of identifying the manufacturing research needs in the new eastern member states. The ManVis key messages have been disseminated at the policy level to a wide set of stakeholders and actors of the European Commission, the member states, and industry. During the interviews for this follow-up brief, the communication with European policymakers was described as very good and the interaction with the EC as very supportive, in particular with regard to the central goal of feeding the results of the foresight exercise into key European initiatives such as the Manufuture European Technology Platform. In sum, the outcomes of the Manvis project served to bring manufacturing experts with different national and professional backgrounds together to discuss the visions and the possible paths for securing the future of manufacturing in Europe. The results of the ManVis project have been fed into the EU’s Seventh Framework Programme. It was reported during one interview with the organisers of the foresight that a central achievement of the ManVis project was to involve the new member states in the development of a Strategic Manufacturing Research Agenda at this particular time. While the EC only had partial knowledge about key institutions and actors shaping policy development processes in areas related to manufacturing, it was an important indirect achievement of the ManVis foresight initiative to involve many experts and policy stakeholders from the new member states in defining and assessing the manufacturing research needs at the European level. In this sense, the networking effect, particularly during the Delphi preparation workshops, was highly appreciated by European policy stakeholders because they provided a unique opportunity to get acquainted and build strong relationships with key experts from these countries and to use the foresight initiative to define priorities for the first calls for proposals for the upcoming Seventh Framework Programme. In this sense, the direct involvement of the new member states in the definition of research topics to be supported was stated as one of the most important, yet unplanned and indirect, contributions of the ManVis foresight process. The research topics thus identified are considered to have real industrial relevance and the potential to produce measurable impacts in terms of marketable products and services or more efficient manufacturing methods in the context of the catch-up process that these countries are undergoing. The ManVis foresight process made an important contribution to completing the picture of technology dynamics in manufacturing. At the particular time of realisation, i.e. in the aftermath of the 2004 EU enlargement, the Delphi survey not only set out several possible trajectories for developments of future manufacturing processes and policy scenarios, but it also helped to define the R&D position of 22 EU countries. In the context of the shifting comparative advantages due to the salary increases to be expected particularly in the new member states, the ManVis foresight provided an important platform to learn about manufacturing research priority topics and the adaptations needed at the level of companies and innovation systems. Beyond the identification of research needs, a concrete achievement of the ManVis foresight lies in the strong integration of key stakeholders from both public policy and industry of the new member states in the long-term planning of European research funding for manufacturing.